This is my first part of Body Shop and now I have found a lot of products in my tampering. 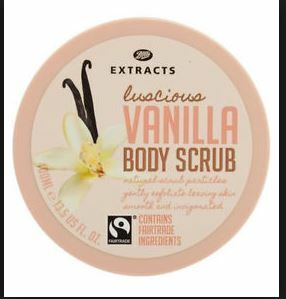 For today, I will talk about the body shop Spicy Vanilla Body Scrub. So, let’s start. Let’s start with the smell. With so many signs of spices it just smells wonderful – Vanilla smells. Body Shop Spicy Vanilla Body Scrub is a creamy colored colored color to brown due to cocoa butter and has lots of spices and walnuts. Nut shells can feel harsh for the first time. I think that sensitive skin should pass But, the second and third time were amazing with cleansing. When the skin is completely wet and warm, after using it after bathing, the butter is well absorbed and moisturizes the skin from the inside. And, the granules do not feel rigid. Body Shop Spicy Vanilla Body Scrub is extremely creamy and trivial in stability, so it sticks to the tub cap on the tube or inverted. Nail Chewing Habits Can be Very Heavy! नाखून चबाने की आदतें बहुत भारी हो सकती हैं!